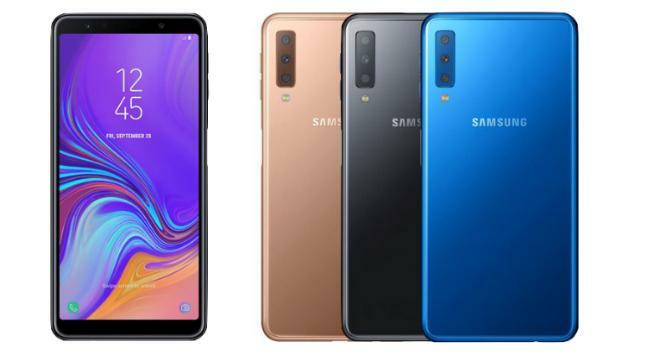 Recently, the well-known South Korean mobile manufacturer Samsung has announced a new Galaxy A series mobile phone with some interesting specs and features. Do you people remember when recently Huawei launched its new P series mobile phone Huawei P20 Pro with three rear cameras? Now, Samsung is taking some cues from its well-known Chinese mobile phone competitor’s new flagship mobile phone and as a result, they have introduced the new Samsung Galaxy A7 2018. 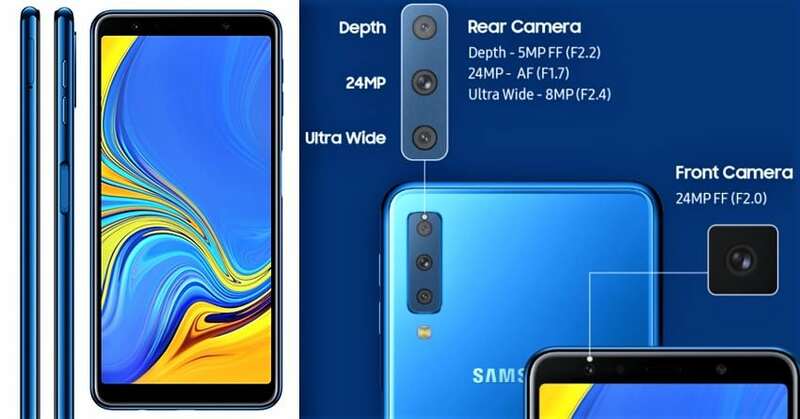 This year’s new Galaxy A7 2018 is taking a leap ahead by being the first Samsung mobile phone to be launched with triple rear cameras. Samsung A7 rear setup features a main AI-enabled 24Mp f/1.7 sensor accompanied with a 5MP depth sensor. Both these cameras allow the phone to give its user the feature of Live Focus with an adjusting Bokeh effect. Then there is also an 8MP 120-degree ultra wide lens which allows the user to take wide-angle shots in an effortless manner. So, for selfies, you get to see another 24MP selfie shooter with variable LED flash. Despite not having a secondary sensor at the front, the all-new Samsung Galaxy A7 2018 still has the capability to mimic studio lighting and Bokeh effects. We also have a good news here that it will also be going to be the first midrange Samsung mobile phone to come with AR Emoji just like it is seen in the recent launch Samsung Galaxy S9 and S9 Plus. Let me now discuss some of the usual stuff about the new A7 2018. Samsung Galaxy A7 2018 price is yet to be officially announced by the Samsung officials for its valued consumers across the globe. However, there are fan-made expectations that it will get a price tag of 500 EUROs which roughly makes around Rs. 73,000 PKR. Now let’s wait and see at what price this new A series mobile phone by Samsung is launched in Pakistan. This phone is expected to hit the market in October 2018. When we talk about its display screen, you will get to see a Super AMOLED 6.0-inch Full HD+ touchscreen with an aspect ratio of 19:5:9. A7 2018 will be featuring a premium sandwiched glass design which is previously seen in Samsung Galaxy A8, but the only difference is that its fingerprint sensor is embedded in its metal side frame. Moreover, it is also becoming with Samsung smart assistant Bixby, Samsung Health and Samsung Pay. 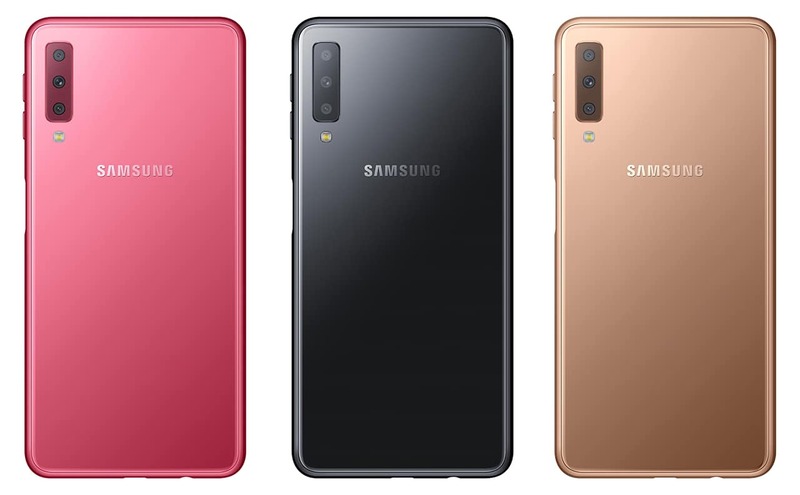 Samsung GalaxyA7 2018 is going to be powered with a powerful 2.2GHz Octa-core Exynos 7885 processor which is coupled with 6GB RAM. When we talk about its internal storage, you get to see that it will be coming with 128GB of internal storage. The phone will be running on the latest Android Operating System called Oreo v8.1, which will allow this phone to perform multitasking in an effortless manner. It is going to be powered with a 3300mAH battery, which is expected to give this phone a standby time of 1-2 days depending on the usage of the user. This phone is expected to be available in two appealing colors which include Blue and Black. After this recent launch by Samsung of a phone with triple rear cameras, we now also can expect that as per the recent rumors about Samsung Galaxy S10 to be coming with five rear cameras might also be true. Well, let’s wait and see what this South Korean mobile manufacturer has in its bag for its valued consumers across the globe. Do share your views about this new phone in the comments sections below.